All you need is creativity and stickers to make these educational games! Not only are they fun, children develop fine motor control, and eye/hand coordination. Depending on the task, they may verbalize and interact with others, as well as use their imaginations. For example, alphabet stickers can be used to make simple words, heart stickers sometimes come with the word “love”, and seasonal stickers may have phrases such as “spring is here.” The games and activities with stickers are endless. Stickers can be arranged on paper (or a paper plate) and children can use these pictures to tell a story. For example, if you choose teddy bears as your weekly theme, invite the children to choose from a variety of teddy bear stickers. They can place these onto paper and tell an original story about the picture they have created. Older children may enjoy writing their story underneath the stickers. Make time for all the children to share their artwork and stories together. Provide four different pairs of stickers (for example, two stars, two smiley faces, two sun pictures, and two dogs.) You can also use alphabet stickers and match letters. After talking about the stickers, fold a piece of paper in half vertically. Help the children place one of each sticker down in a column to the left side of the fold. Arrange the other four stickers in a column to the right of the fold. With crayons, children can draw lines between the stickers that match. Put four stickers in a row on a piece of paper. Use three stickers that have something in common and one that doesn't belong (such as three stars and a cat). Invite the child to circle the sticker that doesn't belong to the group and explain why she did it. For older students, use a more challenging selection of stickers. You may gain insight into how the child is thinking as you hear the reason for her choice. In this preschool game, draw a horizontal line on a sheet of paper. Ask the child to place a sticker above, below, on, under, or over the line. Or let the child place the sticker where she wants and use prepositions to describe the location. Draw lines or circles of different colors. Ask the child to put a sticker inside the red circle or next to the blue line. Invite children to match colors, asking them to draw (with crayons) circles or lines around or next to the same colored dot that they have placed on paper. For example, draw a red ring around all of the red stickers. Use colored dot stickers to create a pattern such as red/blue/red for a child to copy. You can also use picture stickers to create a pattern such as star/fish/star. Increase the challenge by adding more stickers to the patterns. Fold a sheet of paper into fourths. In the first box, write the number 0; in the second box write 1, and so on. Depending on the child's level you might also draw a dot in box 1, two dots in box 2, and so on. Challenge the child to read the numerals or count the dots and put the correct number of stickers in the box. Puppets have been a tool in education for children to verbalize and interact. One of the simplest puppets is printed stickers on the fingers. 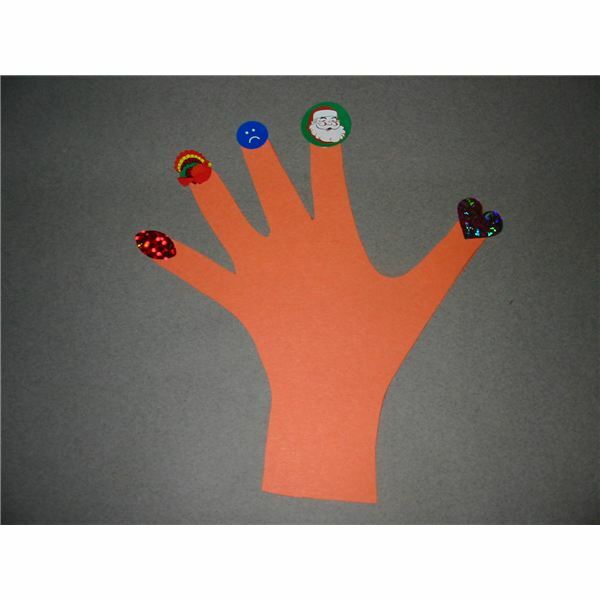 Invite the children to place a different sticker on each finger. Encourage the children to let the sticker characters "talk" to each other. Recite stories and sing songs together using the sticker puppets. If a child doesn't want to wear the stickers on her fingers, attach them to wooden craft sticks. These are only a few ideas. You will find many more ways to challenge your students and help them learn. Stick with stickers – make them an important part of your curriculum!